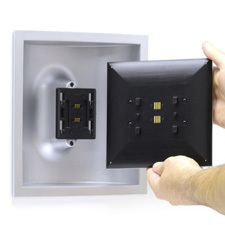 The OLED Tile is a light fixture concept created to explore the use of organic light-emitting diode (OLED) technology in a modular and interactive fashion. Primary features include a removable 6.8-inch OLED panel, individual addressing/control via WiFi or Ethernet, ambient light and tilt sensing, and an on-board Li-Ion battery/charger. 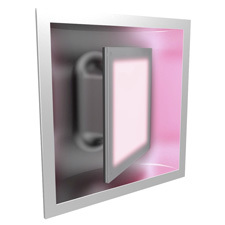 The panel is mounted to a reflector by a vertical hinge and swivels 30 degrees in either direction. The color displayed on the panel changes based on the panel’s position. 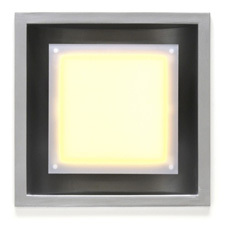 Coordinated by Philips Color Kinetics and unveiled at LIGHTFAIR International 2013. Grand Idea Studio contributed to the OLED Tile’s electrical design.